You need only so much oc profiles, how much fan speeds you want. 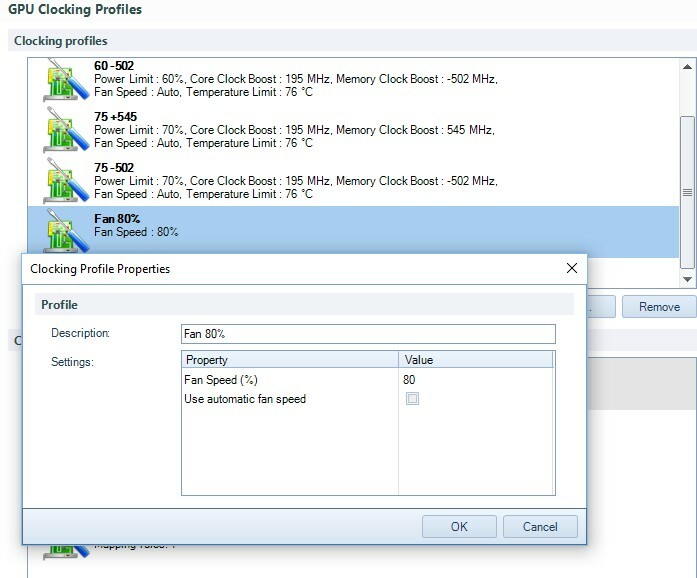 only save oc profile with only fanspeed in it. You can use this profile for every miner you want. So you need only 2 or 3 rules in my opinion for all miners. - Define custom data sources for coin properties; Difficulty, Block Reward and Exchange rate. Use expressions to load values from any JSON data source or plain value source. through modification of profile clocking, I must choose another complete profile that has the quality of 80% of fixed FAN. But that's what I say. If I have 100 OC profiles, I have to make another 100 equal ones that only change from automatic to one with fixed speed. It is not an option for me. I work with more than 20 people, I work with 1060, 1070, 1080ti and RTX, you know how many OC profiles I have. To think that I have to duplicate all of them and have another with fixed speed does not work for me. I hope that ne future add a rule option in which only change the speed (internally load the chosen profile or change the car to a fixed number determined by me), I do not see it complicated. And with only one rule I have everything solved. That option of the image, as you said is for ASIC, but it would be perfect as is for GPU, that respects the OC of Pl, Core and MEM, and that only changes the FAN. As I already have other rules that if it reaches 82 degrees it changes to another profile, it works very well and if it reaches 84 it turns it off. I do this in case fans are broken, the miner shuts down. I hope you add it someday, something as simple as capture and work in GPU. Internally the rule would throw the same OC just by changing the fan. I just want to say thanks for the new multi-GPU-benchmark. Extremely useful now, awesome! lol you are wrong. You need only 1 Profile, with only fan 80%, unmark the other properties. It worked perfect, we have 200 GPU, every card with a single profile. 20 People work with you and no one get this to work? You will see the Xfox currency and its estimate of more than 7000 coins in a day (rigti 1080ti). But it's wrong, I think the formula of your profit is not very accurate and I can say it because we measure and test all the currencies / pool and elprofit is between 0.70 to 0.95 90% of the time, but it's not what same mine to 0.80 that to 1. In this case, this Xfox coin has a blocking time of 2 minutes and has a reward of 2.79 (removing fee from the pool), the maximum coins per day is from 2008, it does not matter how many machines and the hash is the same because the difficulty it adjusts itself, the maximum is 2008 coins per day. With which his estimate is completely wrong in this currency and slightly deviated in many others, but it is no longer a question of data, it is a question of formula. It's just an example where the formula is not right. Neither can it be to mine ZEL when its real profit is 0.65 and so many currencies. You imagine mining ZEL to profit 1, but then only receive 65% of the mined. That's why I recommend everyone to do pool and coin tests, if you change the pool you have to repeat the test. Last detail, the benchmark. When I do a 2 or 5 hour test, what value does it give? I do not know exactly what data is the one that shows and saves the benchmark. I feel so critical, it's a huge job, full of great difficulties, all this is normal. Your current formula can be used in some way for the autoexchanges, because there you do not know what currency mines or their data, and there their formula makes sense. To mine direct currencies, it is not adequate, it can and must be improved. And take into account the maximum daily production of coins per day, so as not to give strange numbers very high as in the example I have set. first thank you so much for answering the previous question, that was exactly what you guessed! now I have another problem, hope you can shed some light on this too. I just upgraded the firmware of my antminer s9 to the latest, and now the Awesome Miner cannot do anything with it except showing its hashrate, that's because the api access to it is shown to be restricted. I have tried configuring api access as explained in the software's tuts, it shows "Connection Failure" on the API access configuration window. this time i left the username, password fields blank but no help, also tried both "root-admin" and the web interface username-password too but those didn't work also, the same Connection Failure. I even tried the manual configuration using ssh commands, again no help! I will be so grateful if you could help me out in this one too. So it does not work to put x16r, x16rt, x16s, X17 and the other X, because it will not make an average hash, it will only take the last hash sent after 5 hours. So far I do it manually, I set to mine x16R I leave it at least 2 hours, I take captures every 10 minutes and then average the hash value of all the captures. That is a very heavy work, and more when each rig is different. @patrike should average the benchmar hash, if not, the benchmark is totally useless for AL-GOS that change subalways, it just is not worth it. @PAtrike is there no way to average the hash value of 2, 5 or 10 hours, during a benchmark? DO NOT UPGRADE YOUR BITMAIN ASIC MINERS TO LATEST 2019 FIRMWARE !!!! The formula itself is correct and gives the exact same results are WhatToMine and CoinCalculators in general. There can however be specific coins that do something differently where you manually need to adjust the profit factor as it's not possible to compute the number of coins per day the standard way. Yes, the plan is to add support for the "NetHash" way of doing the calculations as well, where Block Time is one of the factors. The idea is also have this configurable per coin so if you run into a coin where the standard way of doing the calculations doesn't give the expected results, you should be able to switch to this other mode. It should be the average but excluding a few samples in the beginning as those first samples are typically too low. However, I did notice an issue here with long running benchmarks so I will make a correction for that case. Thanks for finding it. In addition, I know that a number of Awesome Miner users already contacted Bitmain about providing a solution where their miners can be managed (via the Privileged API concept). It should be in Bitmains interest to let their customers can manage their miners in a good way. I would actually encourage users of Antminers to contact Bitmain on this topic to push for a solution. Even if Bitmain want to disable SSH for some reason, they should still add a setting in their web interface to allow the user to enable Privileged API access. As always, thank you for your compression of the problems and be the first to want to solve them. That says a lot about you as a good programmer. As a last suggestion doubt. A rule that changes the fan speed of the rigs graphics without having to restart the mining. Thanks in advance for the types of profit. It is clear that the other type of profit requires much more work, we in our group assume it, and when closer to reality better. The plan is to add support for setting GPU properties like fan speed directly via the rule actions. Today you can use Clocking Profiles via the actions as discussed earlier, but it will be easier once you can do it without the profiles.